I love short stories because, when they work, characters reveal in a few pages what is deepest and most intimate in their lives. The author disappears and I am no longer reading a story but entering it. Because it distills what is essential, the way a poem does, the intensity and details of a short story linger. In "Awaiting Orders" by Tobias Wolff, we know who the sergeant is beneath his disguise because we witness his desires and secrets and failures. We mourn for him. I don’t believe our knowledge would increase, and could very possibly diminish, if we had to accompany him through chapter after chapter of a novel. Several times after slogging through a contemporary novel, I’ve thought, "It’s so padded. But it would have made a terrific short story." Of course there are wonderful novels - but often when I’ve finished a short story, I feel as if I’ve read a novel. I went in and had a cup of coffee. The coffee was reheated, black and bitter—its taste was medicinal, exactly what I needed. I was already feeling relieved, and now I began to feel happy. Such happiness, to be alone. To see the hot late-afternoon light on the sidewalk outside, the branches of a tree just out in leaf, throwing their skimpy shadows... I did not think of the story I would make about Alfrida—not of that in particular—but of the work I wanted to do, which seemed more like grabbing something out of the air than constructing stories. In that same story a character relays a family secret and the narrator says, "There was some sense of triumph about her, which wasn’t hard to understand. If you have something to tell that will stagger someone, and you’ve told it, and it has done so, there has to be a balmy moment of power." Short stories contain that power. It’s difficult to pare down a story to a handful of pages and get rid of what’s extraneous. But when successful, like reducing wine to make sauce, the end result is concentrated and rich. A short story is like travelling to an exotic country for a brief visit. Shopping in a market or riding a bus, rather than being mundane experiences, stimulate the senses. We see things as if for the first time because, in this country, it is the first time. The world of a short story has that vitality. Because we do not stay too long, the unusual retains its mystique. There are many short story collections I love: All Aunt Hagar's Children, by Edward P. Jones, Love and Obstacles by Aleksandar Hemon, Man Descending by Guy Vanderhaeghe, Drown by Junot Diaz, Our Story Begins by Tobias Wolff, Unaccustomed Earth by Jhumpa Lahiri, Gold Boy Emerald Girl by Yiyun Li, Both Ways is the Only Way I Want It, by Maile Meloy, every collection of Alice Munro’s (how can I choose one?). Several individual stories have had a powerful effect on me: "Werewolves in Their Youth" by Michael Chabon, "An Apology" by Ramona Dearing, "Cowboy" by Thomas McGuane, "Or Else" by Antonya Nelson. After reading their stories, I’ve wanted to write to each author and declare my undying devotion. But I’ve resisted the impulse. I did not raise my hand during the question period at an Edward P. Jones reading, as I wanted, to blurt out, "Your readers love you." Instead I began, slowly, painstakingly, to write my own stories. As Emerson said, "What lies behind us and what lies before us are tiny matters compared to what lies within us." The short story zooms in on what lies within us. 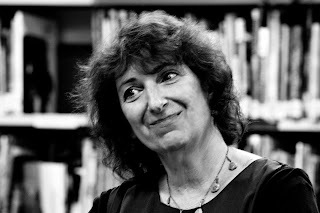 Carole Glasser Langille's fourth book of poetry, Church of the Exquisite Panic: The Ophelia Poems, will be published in the fall of 2012. 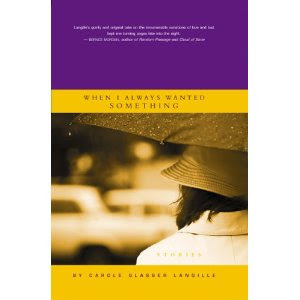 Her last book was a collection of short stories, When I Always Wanted Something. She teaches Creative Writing:Poetry at Dalhousie University.